Speaking of Strangeling Vinyl - we just got our huge shipment of "Alice in the Starry Night" inventory in, so if you pre-ordered your doll they are shipping NOW. If you were waiting for them to get in stock - we have them NOW so you can order worldwide (we ship anywhere) right here on my website today! And something fun just for my fans - I'm giving away an original CUSTOM painting up at my Patreon at 8pm EST this coming Monday night! 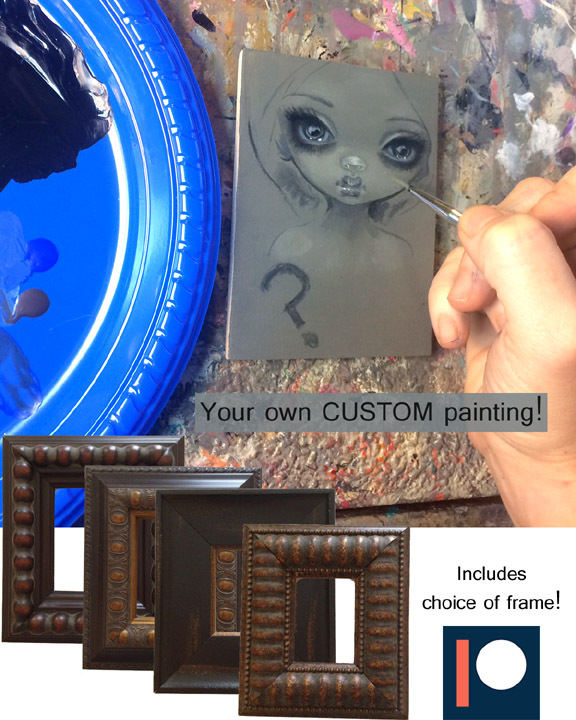 Join Patreon here - a custom painting means that you'll get to tell me what to paint and even choose a frame. Tons of other fun stuff happening up there too right now. New paintings! I have four new paintings to show you! Two have sold, one is up for auction, and one is now available at a gallery! 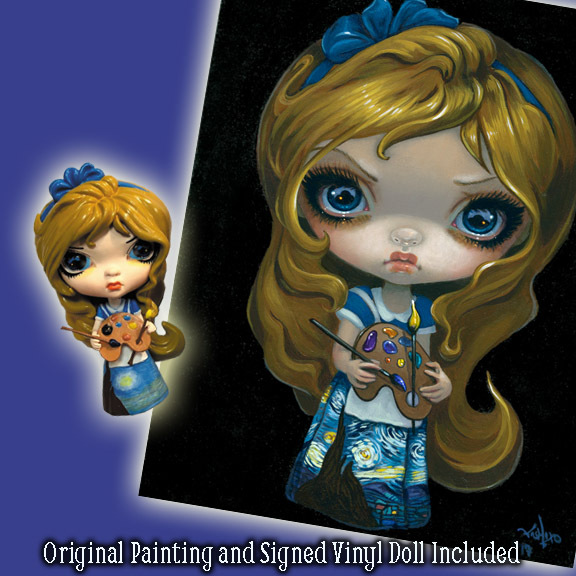 The first is the original concept painting for my "Alice in the Starry Night" vinyl dolls - I'm doing an auction right now for the actual original 8x10" acrylic painting and you also get a bonus autographed Alice vinyl doll too! 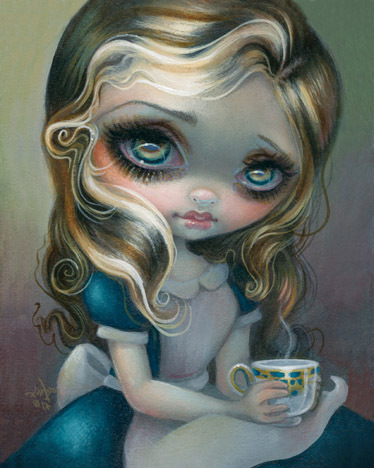 Bidding for the original Alice painting / Doll auction is on eBay right here. Bidding starts at a penny but it looks like that is moving fast! 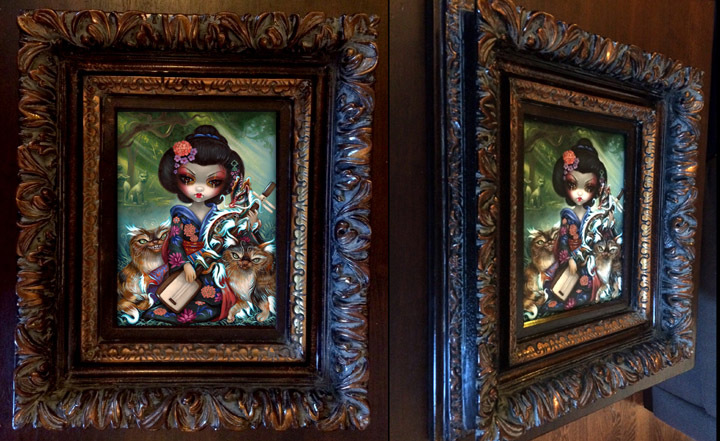 "The Moon" original 78 Tarot painting has sold, but prints are here, and then we have my gorgeous geisha girl in "Kirin and Bakeneko" available from the Corey Helford Gallery in Los Angeles (email them at sherri@coreyhelfordgallery.com or call (310) 287-2340, they ship worldwide). We do have prints & canvases of "Kirin and Bakeneko" here. Finally, "Alice's Advice" is a brand new original painting for my upcoming Alice in Wonderland Oracle Deck - the original has sold, but we have prints & canvases now available here. We have a NEW enamel pin though this month! 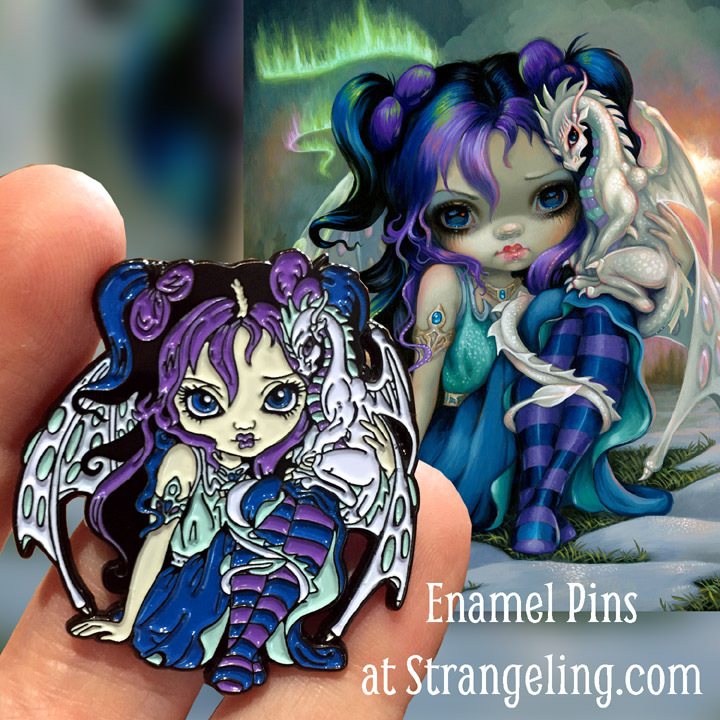 The January Pin of the Month - "Frost Dragonling" - available to the public for sale here! You can see all of the Strangeling Pins we've released so far together here. Or alternately you can sign up for the Pin Collector Club through my Patreon here and you will automatically receive Frost Dragonling along with the Patreon-only pin "The Scarecrow" and you'll get each new Pin of the Month as they are released (along with Patreon-only pins and exclusive bonus pin giveaways, discounts, and more). We are releasing a new Strangeling Lanyard too and you will receive the lanyard (and any new lanyard designs we come out with automatically!. 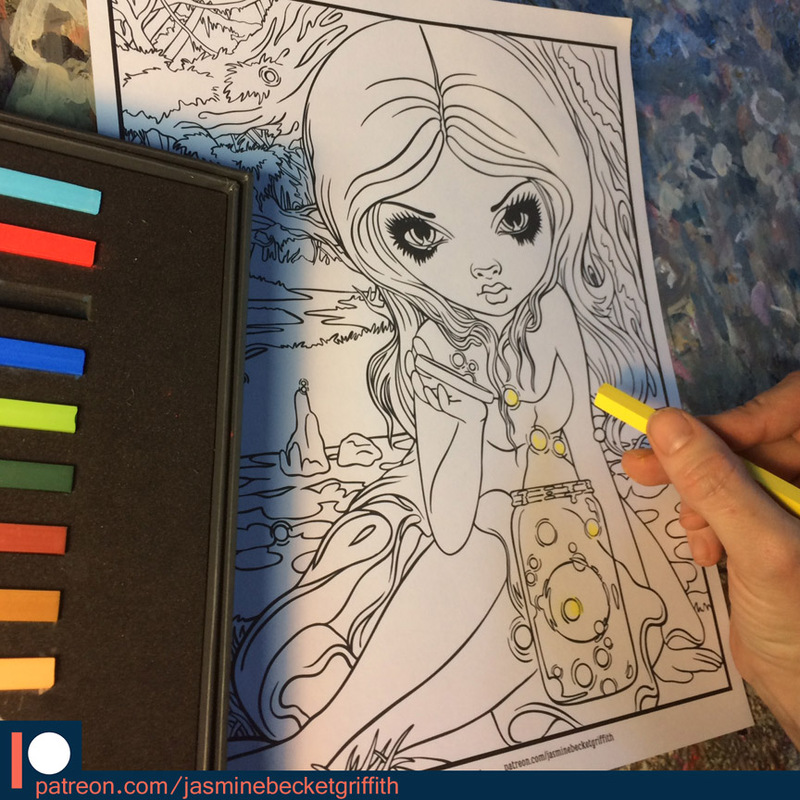 Speaking of Patreon - I've posted a new Exclusive Patreon coloring page - "Releasing Fireflies" - a new downloadable page - if you are already part of the coloring tier ($5+) you can click here and see all the new pages! Not yet a member? Just $5 lets you immediately download ALL the coloring pages so far, all at once. There are eight pages in all (so theoretically you could always join for a week, download all the coloring pages and quit if you don't want any of the other perks, all for $5). If you do enjoy them, stick around and you'll get new ones as they are added (and of course previews, sneak peeks, behind the scenes content, giveaways including original paintings & more). Simply click the link to Patreon here and click the orange "Become a Patron" button, it takes less than sixty seconds. Finally - we have a couple of LAST CHANCE canvases - the final #5/5 Masterpiece Edition canvas of "Alice Through a Vermeer Glass" is up for auction here and the final #25/25 Limited Edition canvas of "Ninja Dragonlings" is up for auction here. All the limited/masterpiece editions are all gone other than these last ones up for auction, we do still have open editions available however. Wow, and that's it! Now scroll down to see it all! “Kirin and Bakeneko” is an original painting that just now debuted at the Corey Helford Gallery's "East / West" show in Los Angeles! As of the writing of this mailing list, the original may still be available (I apologize in advance if it has since been sold). Contact Sherri at the gallery - (310) 287-2340 or email here - if you are interested in purchasing the original. Prints are now on sale too! 8x10" and 12x16" glossy paper prints, signed by me on the back, only $9.99 and $19.99. We also have limited edition canvases (11x14" only $125, hand embellished, limited edition canvas giclee, only 25 made) up at my website (as well as the story behind this piece). Alice in the Starry Night Strangeling Vinyl Design - Original Painting! Original Acrylic painting 8"x10" - actual production artwork! Auction winner also receives an autographed vinyl doll! The original painting is 8x10" acrylic painting on masonite panel (.25" thick, could be easily framed). This is not a print, or an animation cel, but an actual original painting I painted to create one of my line of Strangeling Vinyl - for "Alice in the Starry Night". (Strangeling Vinyl is now available WORLDWIDE). The first character in my new Strangeling Vinyl toy/doll collection is Alice, and to create the vinyl dolls I first had to do a complete full-scale original painting for the "concept art" on which the doll design is based. This is the actual production art piece used to design the dolls! Second - you get one of the Vinyl Dolls, too! 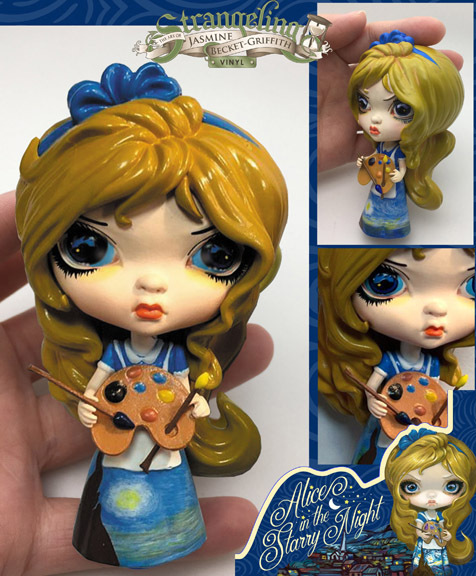 Your little "Alice in the Starry Night" doll is brand new, just released, autographed on the bottom of the doll and also autographed on the lovely box she comes in. 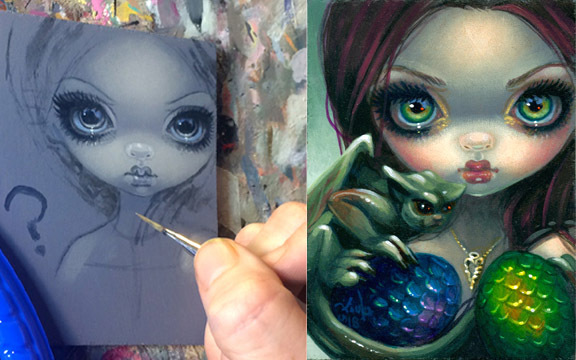 Keep the doll to play with (small parts, ages 3+) or shadowbox it with the original painting - that'd be cool! Just want a Strangeling Vinyl Doll - they are in stock now and available for worldwide shipping right here on my website. My illustration for the 78 Tarot "Mythical" deck - seventy-eight artists, each painting one card. Mine was The Moon! As a "Mythic" deck, each card is supposed to reference well-known cultural/spiritual entities. I've gone with "Selene" or "Luna" (moon goddess, of course!) and visually referenced the Alphonse Mucha piece, including elements of both the Flemish Tarot's Moon (by including the distaffe) and the Rider-Waite Deck (with the wolves/dogs and pillars, and the crawdaddy). The original painting SOLD in advance to one of my Patreon Patrons before she was available to the public, but we have open edition glossy paper prints as well as Limited Edition Canvas prints all at my website . My illustration for "Take Your Own Good Advice" - one of the cards for my upcoming Alice in Wonderland Oracle Deck! She was a tiny little painting, but so many people requested prints of her I went ahead and upsized her to a normal print size, and she turned out great! The original painting SOLD in advance to one of my Patreon Patrons before she was available to the public, but we have open edition glossy paper prints as well as Limited Edition Canvas prints all at my website. We have a brand new pin! The January Pin of the Month - "Frost Dragonling" - is now available to the public for sale here! She is $12.99 and we are happy to ship worldwide. What a little cutie! And many more to come - you can see all the Strangeling Pins so far here . Alternately too, the best way to stay on top of things is to sign up as a Patreon Pin Collector on my Patreon here. While it's still January you can immediately get the Frost Dragonling pin (along with the Patreon-only pin "The Scarecrow") right away, and then the upcoming brand new Strangeling lanyard in a couple weeks), and you'll get each new Pin of the Month as they are released (along with Patreon-only pins and exclusive bonus pin giveaways, discounts, and more). If you are into pins, this is really the best way to go. "Releasing Fireflies" is the eighth Patreon Exclusive Coloring page is up on my Patreon page here! Yes, if you sign up now you can get all eight pages immediately (and all the new ones as they are released of course). It's time for me to give away a new original painting, and I've decided this time to make it a CUSTOM painting again since it was so much fun last time! So far the painting l've started looks like she does in the photo above. The lucky recipient will then get to tell me how to finish the painting! Many of you may know that I often have a waiting list of 3+ years and a pricelist typically well into the $1000s -$10000s -$for custom artwork, so this is a remarkable opportunity. I'm always happy to ship anywhere in the world. Strangeling Vinyls now in stock! 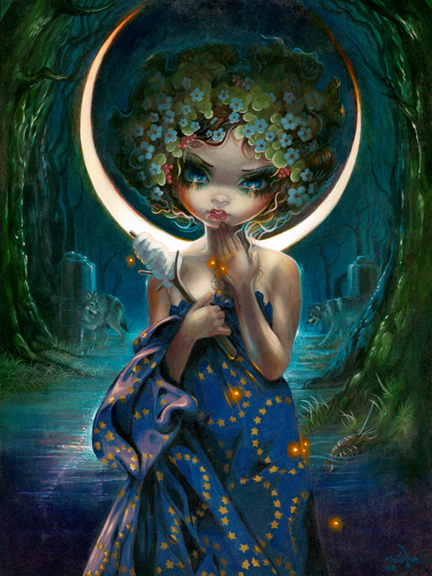 "Alice in the Starry Night" is now IN STOCK available to order (WORLDWIDE) up at my Strangeling.com website HERE. If you've already pre-ordered, your doll has now shipped (you'll receive a tracking number in your email, if you don't see it - check spam). If you haven't ordered yet, we now have all our inventory in stock for immediate shipping! We ship worldwide. Up on my website HERE. On my website HERE they are $34.99 (if you are in a country with a different currency, don't worry - your bank or credit/debit card or paypal or whatever will automatically convert it, you can check at xe.com to see updated currency exchange rates, they fluctuate by the minute). Shipping is actual cost based on your postal/zip code and is calculated during checkout as well (add it to your shopping cart, put your address in, and it will tell you before you have to buy anything).